While researching the art for AMERICANLY, I felt awestruck by the vast and diverse beauty of the land. 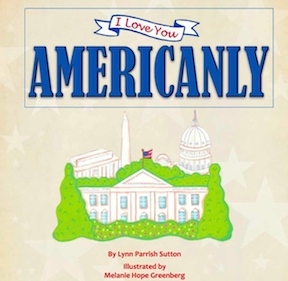 It was fun to create art for a poem that says, "I Love You" described as adverbs, to our nation's cities, states, rivers, oceans, natural and historical landmarks, from sea to shining sea. and a super cool Resources Page which includes my FREE Coloring Pages, Interviews with the Author and Illustrator, a Glossary, and more. 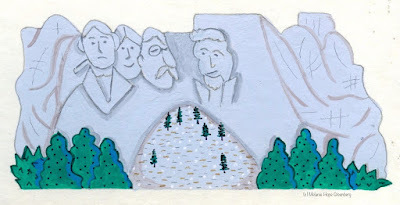 The book celebrated the 100th Year Anniversary of the National Park Service, and has received some wonderful reviews. “I love you Americanly, I must be confessin’. This is one sensational geography lesson." 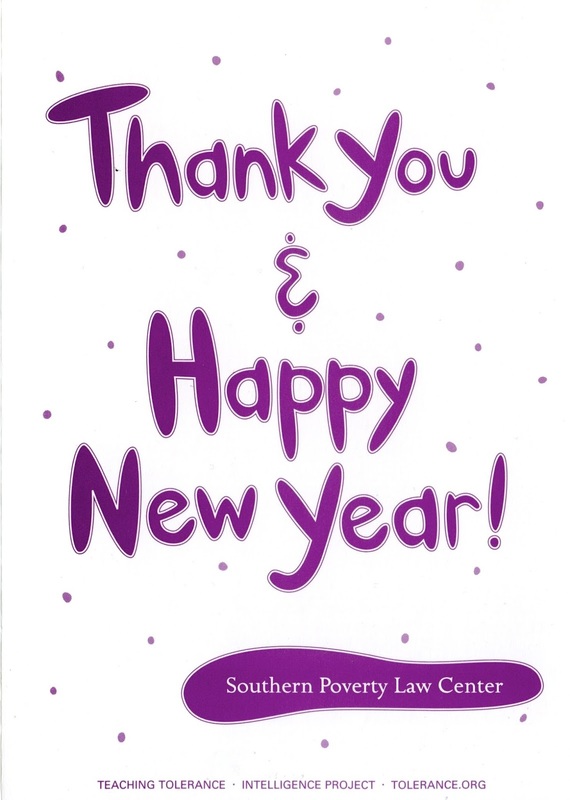 The Southern Poverty Law Center, an American nonprofit civil rights organization based in Montgomery, Alabama, contacted me after they saw my illustrations for the Children's Defense Fund and the AFL-CIO. How lucky! I illustrated two greeting cards and address sticky labels for SPLC! 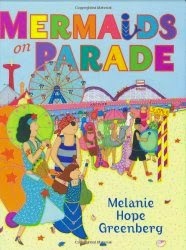 I was invited to blog at Huffington Post by their editor whose children love my book, MERMAIDS ON PARADE. We met at an arts event where I presented my books. I love to visit schools. I meet many inquisitive students from grades K-5 and there’s never enough time to answer all their questions towards the end of my presentations. I love coming home with their questions to answer on my blog. Thanks to the students and teachers at PS130 Brooklyn and PS120 Queens for their questions! Q: How often do you actually do the writing? A: As an illustrator I can paint books for authors other than myself. I’ve illustrated 11 books for other authors. I love to interpret their stories with colors, textures, and form. 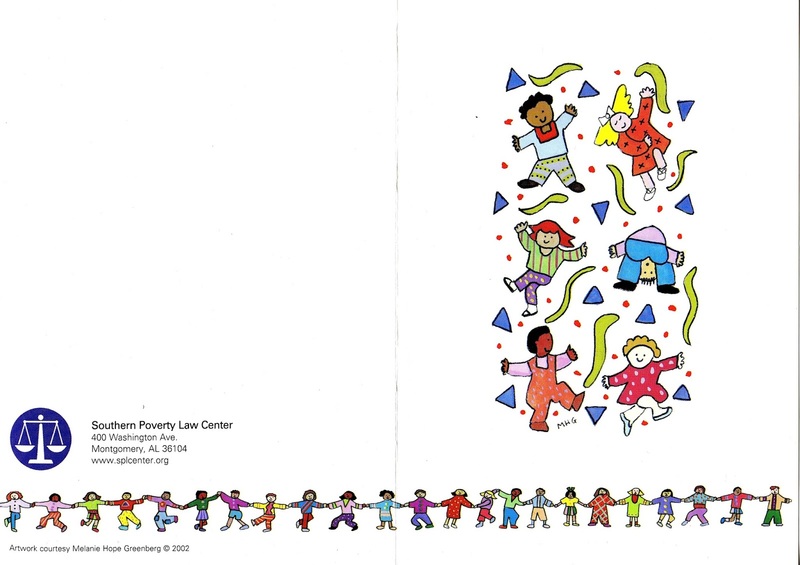 What I find most fun as an illustrator is the challenge that I cannot change the author’s text. I must rise to this challenge by working inside a boundary of the author's vision, then add my vision in a seamless blend. 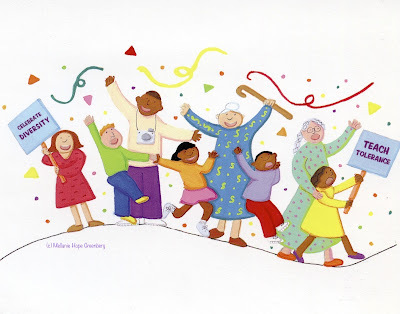 Picture books I have illustrated for other authors. A: By designing and painting the books I learn about my inner life through an outward visual medium. During the process of book creation the craft mirrors what is happening in my life at that time. The process helps me see certain life issues clearly. Q: Have you ever written for the New York Times newspaper? A: No, I do not write for the New York Times. However, I am proud to say that my books have been reviewed in that newspaper and my name listed for book events several times. Currently, I’m a Huffington Post blogger and write online essays. Q: Who did you work with to make your first book? I get homework of revisions to work on and bring back. 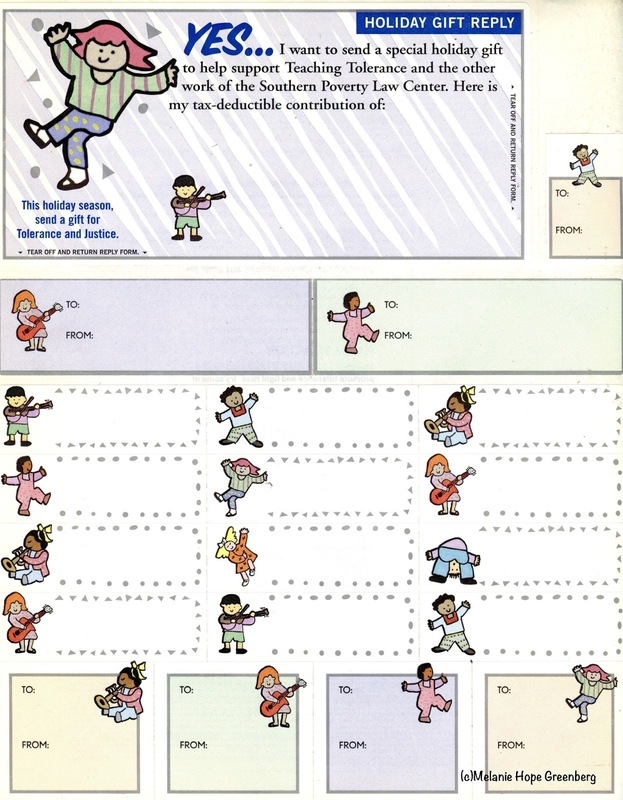 This back and forth goes on until the words and pictures are in perfect shape for your book shelves. Q: Do you have any friends that help you with your books? A: Authors and illustrators usually work alone. However, for my book MERMAIDS ON PARADE, I interviewed my friends. I asked why they marched in the Mermaid Parade and one answer became the main character's theme of “Shy Mermaid Coming Out of My Shell". I took photos of my friend’s wonderful parade costumes then painted those costumes into the book. 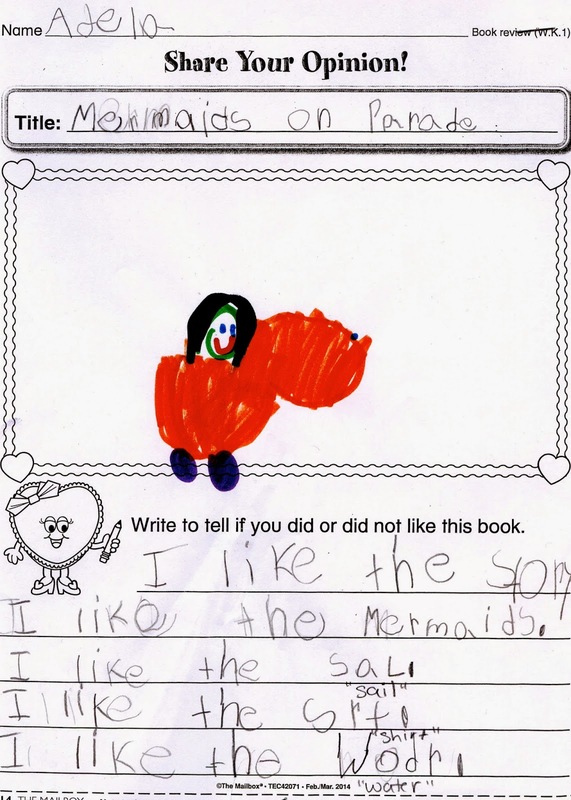 My friends also taught me how to create a mermaid tail, so I added a tail-making craft activity in the book. 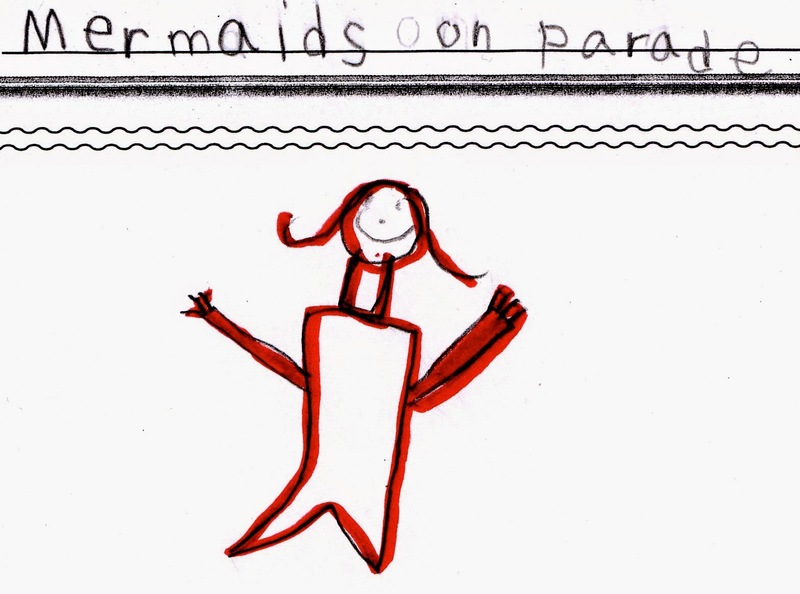 Yes, my fabulous artistic friends in the DUMBO, Brooklyn community really helped me create MERMAIDS ON PARADE. 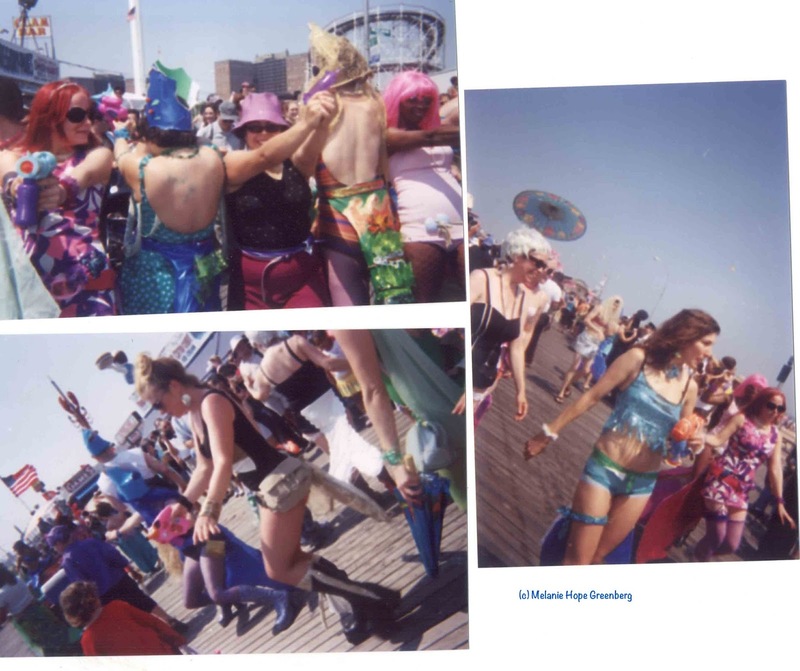 Can you find real life friends and their costumes inside the book, MERMAIDS ON PARADE? The music and art scene in DUMBO, Brooklyn, with it’s artists and indie bands and their offshoots has a vast history. Musician-Producer, Jan Bell, has been in the center of this history since the beginning. 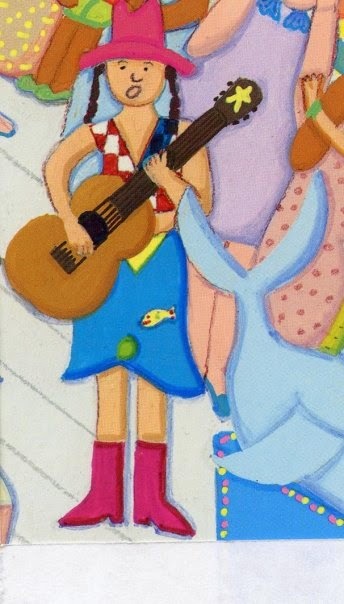 You can find her amongst the colorful artist cameos in my picture book, MERMAIDS ON PARADE. In fact, Jan’s character is wearing a skirt based on the first tail I ever made and wore in the Mermaid Parade. Jan Bell in the book, MERMAIDS ON PARADE. Mermaid tail I wore in the parade. MHG: Why do you march in the Mermaid Parade? Jan Bell: Biggest fancy dress party of the year for me and my friends. I usually march with other old time and folk musicians and like to bring my guitar or banjo with me. I've met a lot of brilliant people playing music in the parade. MHG: What does Coney Island represent for you? 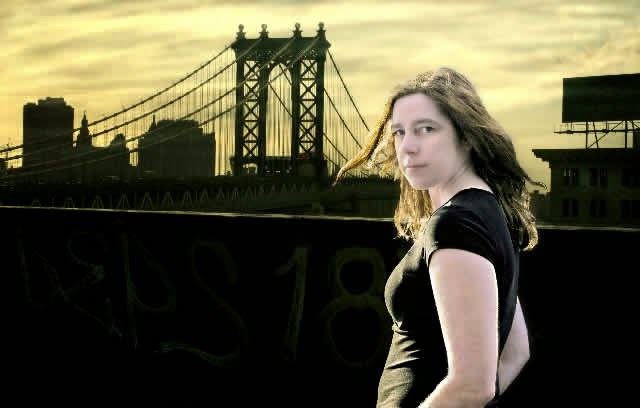 Jan Bell: Well, I always think about the folk hero Woody Guthrie, who spent his last years living in Coney Island. That's where Ramblin' Jack Elliot and Bob Dylan both went to visit him in the 60's...both of whom have names they made up. Woody was born in rural Oklahoma and used to hop freight trains across country singing true story songs about the people he met during the Great Depression of the 1930's. Billy Bragg did a tribute album to Woody Guthrie called “Mermaid Avenue” in the 1990's. Guthrie’s spirit and his belief in equality for all are there for all to hear in his songs. “This land is Your Land”, “Pastures of Plenty” and hundreds more. 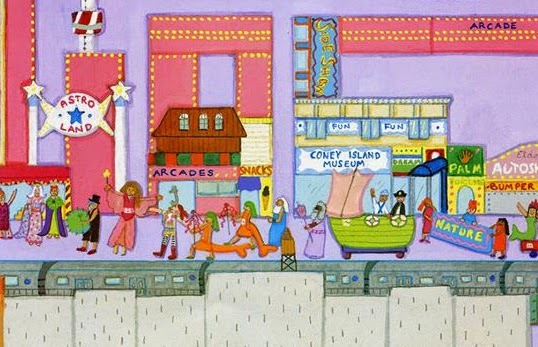 This CD has a song called "Coney Island Seaside Band"
MHG: How do your music ventures connect the NYC arts communities? 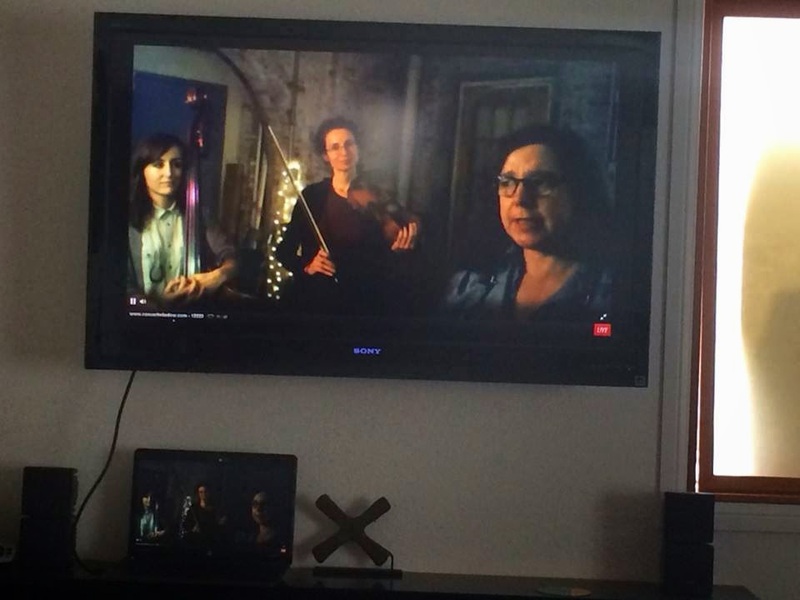 Jan Bell: I am fortunate to work with quite a few small business establishments that ask me to book live music on a regular, often weekly basis. At one time, I traveled a lot all over America and Canada with a folk musician who was a young bright lad. 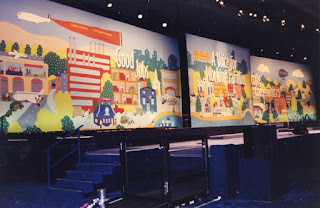 He played venues and festivals everywhere, and I got to meet thousands of amazing musicians and presenters and people in the folk music community. Since returning to live in Brooklyn again, I've kept in touch with people so am able to 'bring the road to me' so to speak. Lots of bands from New Orleans, Austin Texas, Portland Oregon, Nashville Tennessee and Europe and Australia know how to find me and I can book them a couple of shows. They meet new fans and friends in a very supportive environment, rather than being exploited by 'pay to play' conveyer belt stages. This city can be a tough place for a band on tour here for the first time. I'm very happy to play a positive role in their experience instead. As an artist, I go home and play in the UK every Summer, and I tour a little here in the USA, but not as much as I used to. I help run the music at the places where I present the bands, and that helps supplement my income for sure. But I'm happy to play for a good cause, and fund raiser events are always a great time bringing folks together that otherwise may not cross paths. MHG: What are you currently working on? 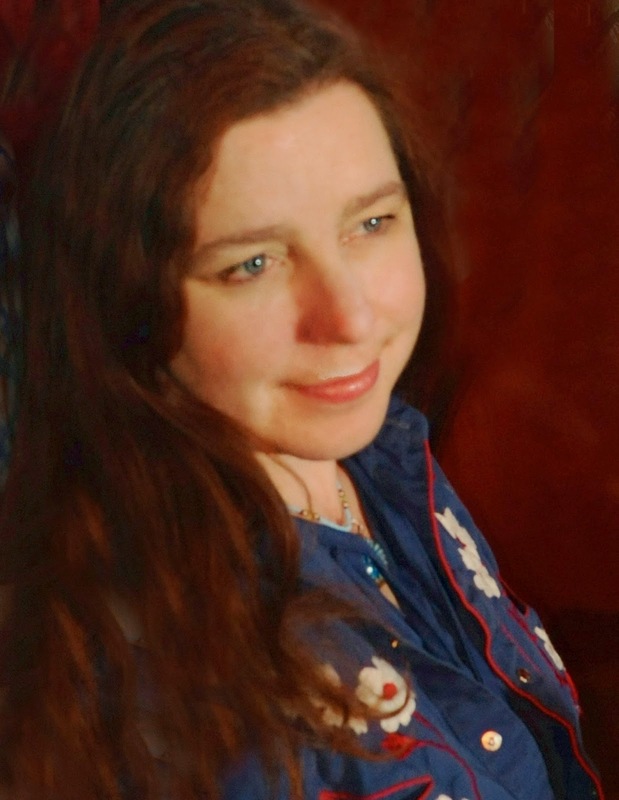 Jan Bell: I'm launching Brooklyn Americana Music Festival 2015. My goal is to connect the two waterfront neighborhoods I've lived in and loved since the late 90's. DUMBO and Red Hook. 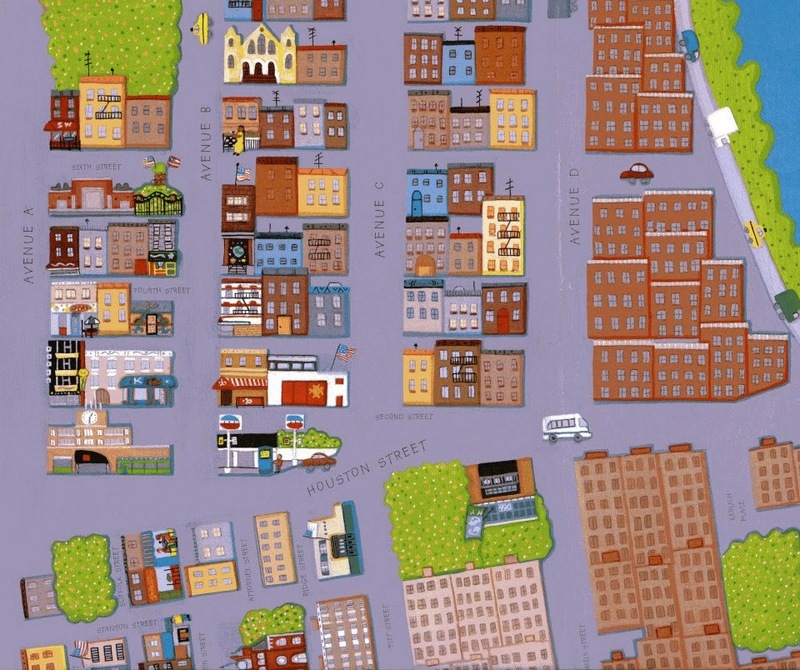 I'm also writing and re-writing all my songs about living here for the next album 'Moonbirds in Brooklyn'. I’m also gearing up to teach a Spring songwriting class series again at the Fabulous Jalopy Theatre. My class is for grown ups but they have an extensive and very fun music program for kids. 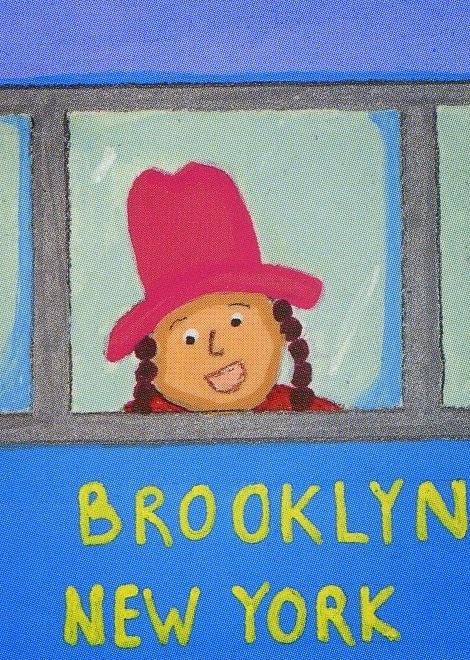 One wonderful morning I Skyped from my cozy studio in Brooklyn with students at the Passow Elementary School in Franklin Park, Illinois. Thanks to Reading Specialist, Elizabeth Drasutis, who set up the visit, for sending a packet of the student’s sweet notes, plus a list of questions to answer. Q: How can you imagine all of the sea creatures? A: It was easy. By using the photographs I took of the public and of my friends at the actual Mermaid Parade. They made the costumes. I just channeled their great creative energies into my picture book. 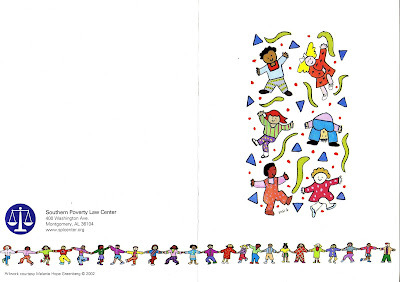 They made it easy to illustrate 100 + characters featured in the book. Q: How do you get picked to be the illustrator? A: I send samples of my illustrations printed on postcards to art directors in the juvenile publishing field. The art is kept in their files. They match an illustrator with an author’s manuscript the publisher had purchased. Or, an agent represents your art and makes portfolio rounds to the publishers. 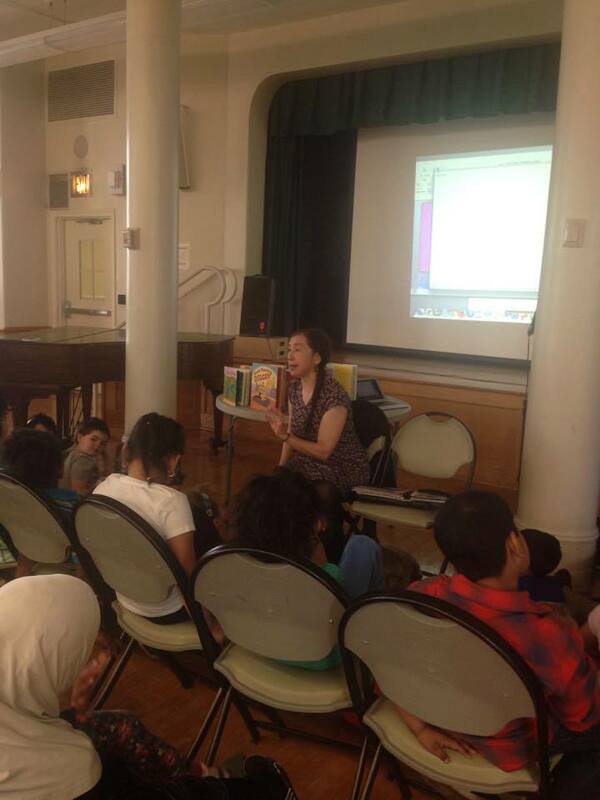 Q: What do you find challenging about being an author and illustrator. Art is always fulfilling so I’d say it’s the business end that can be challenging. Such as waiting in-between books. Having to prove my talent at all times to new people. Or, being very organized tracking the constant flow of new people and changes within the field. A: How many days does it take to make a book or an illustration? Some illustrations are simple and some are complex. It took one month to finish my first book, AT THE BEACH. The art was simple to fit the text. 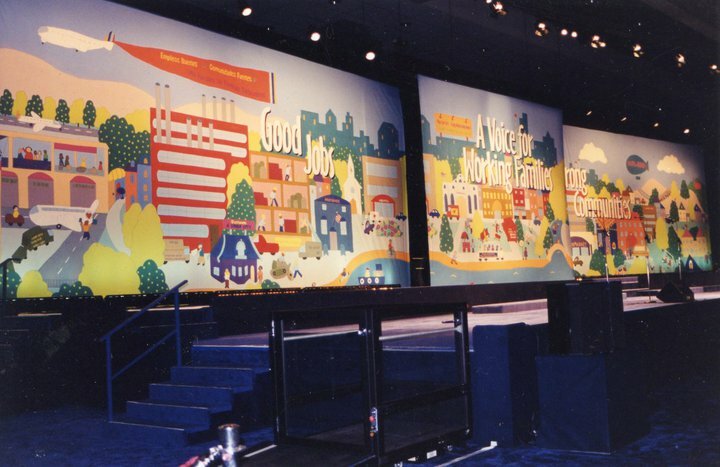 It can also take two weeks to illustrate one scene. The maps I love to create take a long time to finish. 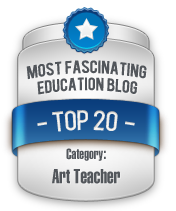 All art and images are Copyright Melanie Hope Greenberg except the student art. School Season has started again! "CLASSIC" MERMAIDS ON PARADE selected by New York City's Official Marketing and Tourism partnership organization, New York And Company. As MERMAIDS ON PARADE gets more popular in New York City and beyond, I presented at a fun event for a children’s museum in upstate NY. That’s where I met writer and mom, Kimberly Kunkel. 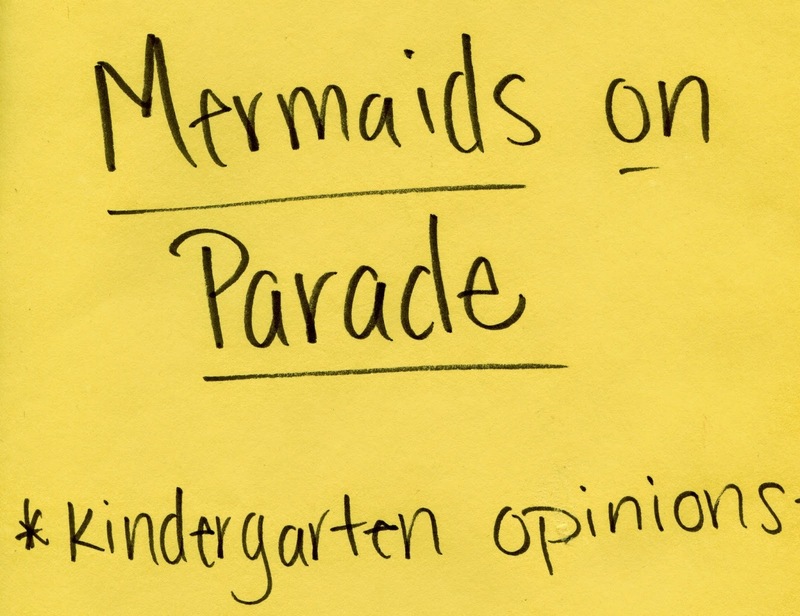 What a wonderful surprise when she wrote a blog post review with a teacher guide for MERMAIDS ON PARADE. Thank you Kimberly!! Last but not least, here is a link to a video taken after my author-illustrator visit with second graders at Brooklyn Central Library's Dweck Center. 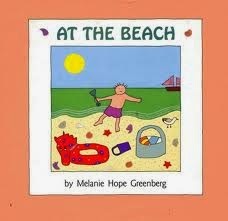 Please contact me to learn about my in school/library or Skype author-illustrator visits at melanie@melaniehopegreenberg.com.